Following its global analyst conference in New York and the long awaited opening of its fourth technology lab in Bangalore, Accenture stays top of the Services Index this month. EDS is second. HCL had a good month increasing its share of voice by four places and just missing a top ten spot. Tata and Keane also put in solid performances. Patni appears to be on a roll and consolidated last month’s impressive eight spot rise with another gain this month. It finally enters the top 25. The losers this month include Equant which fell six places and VeriSign which fell out of the top 25. 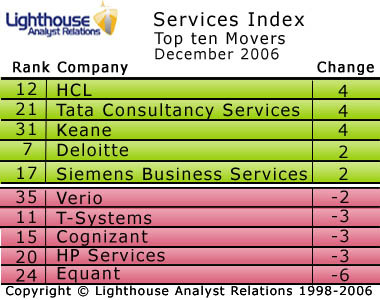 If you wish to be sent the top 25 firms in Services Index each month, email us at analysts at lighthousear dot com. You can also read how we do our Analyst Index rankings. Is Wipro, DiamondCluster and SAIC tracked? Yes, we’re tracking hundreds of firms, including those.